The Catch: Olaplex Step #1 must be used at the time of the hair color service. Your stylist would add it to the color formula before applying it to your hair. This is where the active ingredient starts to go to work. While the bleach lightens the hair, thus making it weaker, Olaplex comes along and strengthens it back up. Not a magic potion. 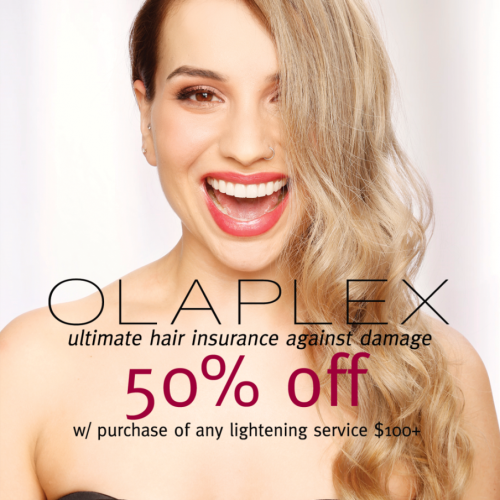 Hair Insurance: Using Olaplex is the ultimate breakage insurance when lightening hair… this doesn’t mean you can do anything you want to your hair and have it come out without damage. Your stylist can push lightening a little bit farther and can mitigate damage during modest lightening services that are correctly done. But if your hair is already damaged, it may be too far gone to be lightened even a little and even with Olaplex. Most times, even healthy hair that is dark cannot be made platinum in one visit, even with Olaplex. It isn’t a magic wand. It is insurance. Just like if you have car insurance, it doesn’t mean you drive your car off a cliff. Same with lightening and using Olaplex. Why is Olaplex so special? All other conditioners, including Olaplex knockoffs, do not have the ability to get to the cellular level of the hair to prevent damage during color services. Other treatments simply coat the hair to protect it instead of re-bonding the protein molecules in your hair. That is why only Olaplex’s patented formula can actually rebuild damaged hair and prevent breakage when lightening hair. Geek Out: When you lighten your hair, the bleach can break down the molecular bonds – called Disulphide Bonds – in your hair shaft. These tiny bonds are key in formulating structural proteins that are keratin. Keratin is what hair, skin, nails are made of. So in your hair, when you lighten it, the bleach has to enter deep into the hair shaft to access the pigment and lighten it. That can cause damage to hair by breaking the disulphide bonds, especially if it wasn’t strong to begin with. 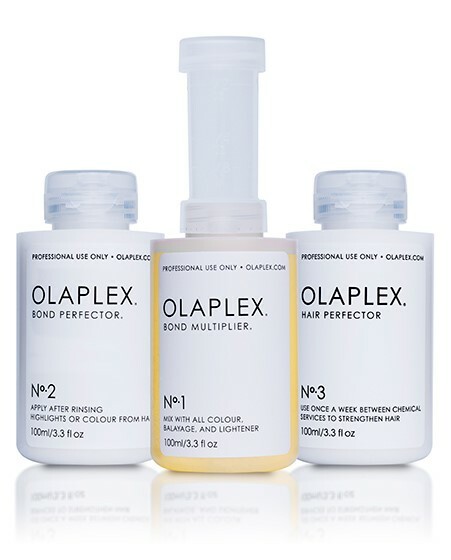 Olaplex goes into the hair at a molecular level and reconnects the bonds that are broken. The structures are stronger and can handle the lightening process better. Olaplex can even help healthy hair go lighter, faster because it is quickly re-bonding the hair as it is lightened. This keeps the structures of the hair stronger. The stronger your hair, the healthier it is. Protips for home use of #3: At home, Step #3 can be used as a separate treatment to repair hair 2-3 times per week. The active ingredient will work within 30 minutes. You do not need to sleep in it. If you do leave it on longer, there no harm in it, but you’re not receiving much benefit. Good For you, good for animals: Olaplex is free of silicone, sulfates, phthalates, DEA, aldehydes, and is never tested on animals. Want to see how Olaplex can work hard to help you get the color you want? Talk to your stylist! 50% off Olaplex w/ any lightening service over $100! Save $25!!! Includes Step 1, 2 & 3. Good Through June 30th/ while supplies last.